Forests, grasslands, deserts, and mountains are all part of the Patagonian landscape that spans more than a million square kilometers of South America. Toward the western side, expanses of dense, compacted ice stretch for hundreds of kilometers of the Andes mountain range in Chile and Argentina. Glaciologist Eric Rignot described these icefields as “one of the most beautiful places on the planet.” Their beauty is also apparent from space. The two lobes of the Patagonian icefields—north and south—are what’s left of a much more expansive ice sheet that reached its maximum size about 18,000 years ago. The modern icefields are just a fraction of their previous size, though they remain the southern hemisphere’s largest expanse of ice outside of Antarctica. The northern remnant is the smaller of the two icefields, covering about 4,000 square kilometers (about a third the size of the southern icefield). On April 16, 2017, the Operational Land Imager (OLI) on Landsat 8 captured this rare cloud-free image of the entire North Patagonian Icefield. While the northern icefield is smaller than its southern counterpart, it still has 30 significant glaciers along its perimeter. Ice creeps downslope through mountain valleys and exits the through so-called “outlet glaciers.” Many come to an abrupt end on land, while others terminate in water. 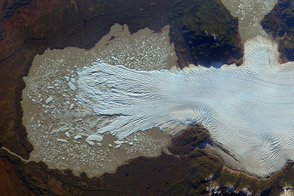 The water-terminating glaciers San Rafael and San Quintín are the icefield’s largest. 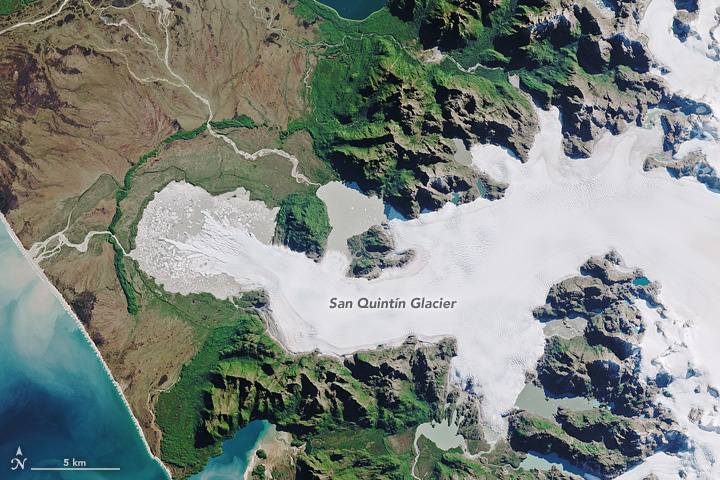 San Rafael Glacier starts near the western flank of Monte San Valentin—the tallest summit in Patagonia—and drains westward into Laguna San Rafael. The lagoon is ringed by a ridge of debris, called a moraine, shoveled into place by the glacier in the past when it was much larger. Visitors to the area in the late 1800s described the glacier as having a large bulbous front, called a piedmont lobe, that spread out well into the lagoon. 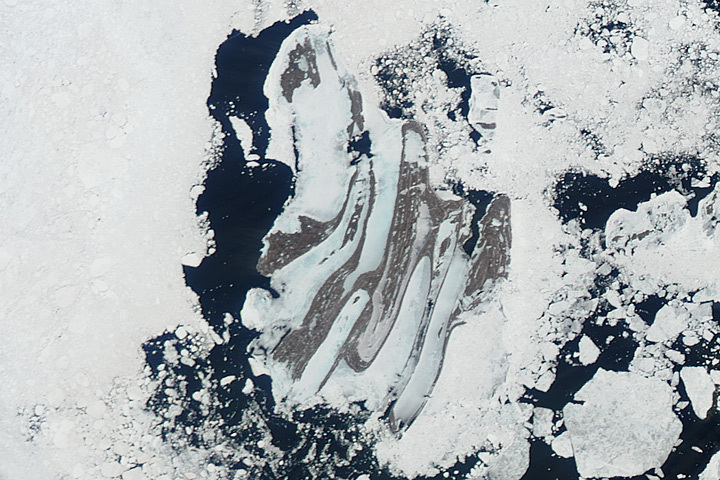 Since then, the glacier has receded and is no longer lobe-like, though it still actively sheds icebergs from its front in a process known as calving. 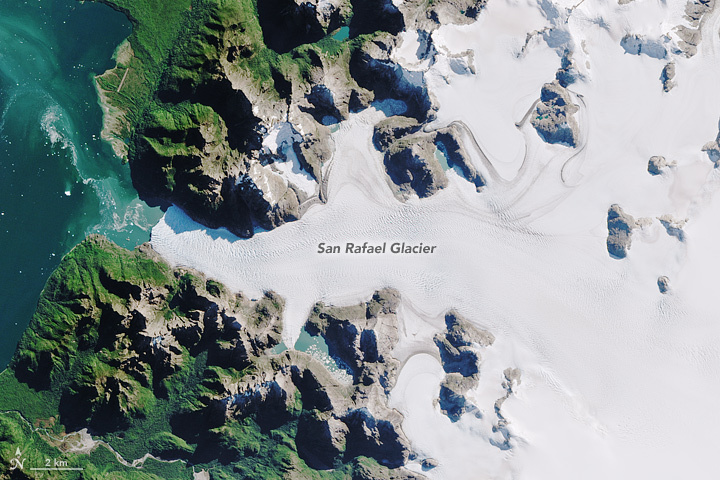 San Rafael is one of the most actively calving glaciers in the world. Part of the reason why this glacier sheds so many bergs is because of its speed. “Flowing” at a speed of 7.6 kilometers (4.7 miles) per year, San Rafael is the fastest-moving glacier in Patagonia and among the fastest in the world. It is also the icefield’s only glacier to come into contact with ocean water. 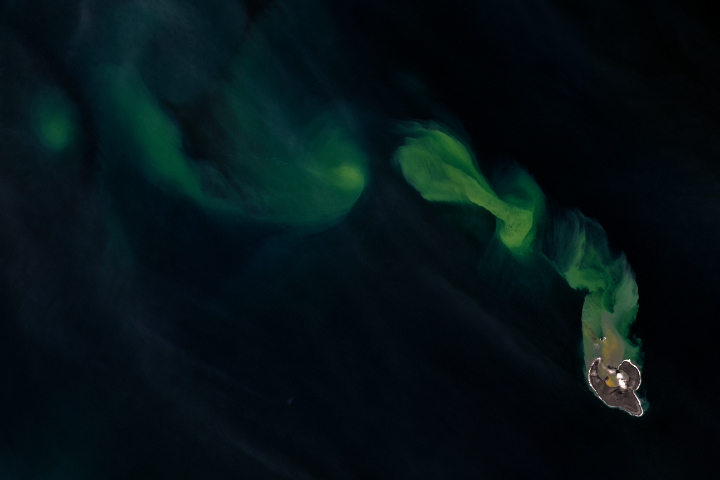 Seawater from the Pacific enters the lagoon through the Golfo Elefantes, which connects to the lagoon via the Rio Tempanos (Iceberg River). At 46.7 degrees south latitude, San Rafael is the closest glacier to the equator in the world to connect to the sea. San Quintín does not flow as fast (1.1 kilometers per year) or calve as many bergs as San Rafael, but it is an impressive glacier on its own, standing as the second-largest in the North Patagonian Icefield. Together with San Rafael, the glaciers drain 37 percent of the icefield. Like its twin, San Quintín has been receding dramatically. 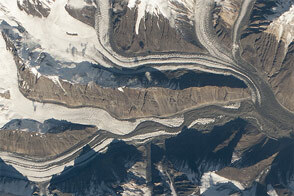 Researchers have shown that between 1870 and 2011, the glacier lost 14.6 percent of its area. For comparison, San Rafael lost 11.5 percent during the same period. NASA Earth Observatory images by Jesse Allen and Joshua Stevens, using Landsat data from the U.S. Geological Survey. Story by Kathryn Hansen. 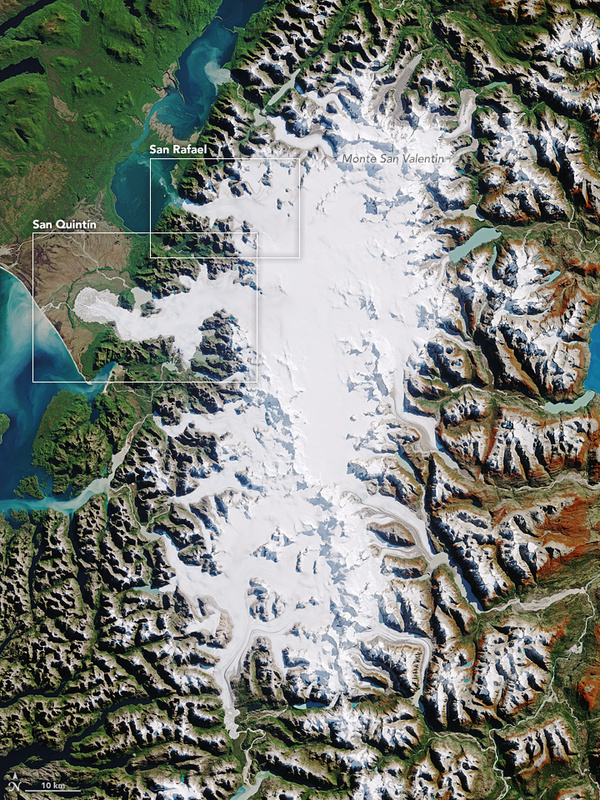 San Rafael and San Quintín are among the largest glaciers draining ice from Patagonia’s northernmost icefield. Araneda, A. et al. (2007) Historical records of San Rafael glacier advances (North Patagonian Icefield): another clue to ‘Little Ice Age’ timing in southern Chile? The Holocene , 17 (7), 987-998. Davies, B.J., and Glasser, N.F. (2012) Accelerating shrinkage of Patagonian glaciers from the Little Ice Age (~AD 1870) to 2011. Journal of Glaciology , 58 (212), 1063-1084. Glasser, N.F. et al. (2006) The geomorphology and sedimentology of the ‘Témpanos’ moraine at Laguna San Rafael, Chile. Journal of Quaternary Science , 73 (1), 629-643. Hulton, N.R.J. et al. (2002) The Last Glacial Maximum and deglaciation in southern South America. Quaternary Science Reviews , 21 (1-3), 223-241. Koppes, M. et al. (2010) Variations in Sediment yield Over the Advance and Retreat of a Calving Glacier, Laguna San Rafael, North Patagonian Icefield. Quaternary Research , 73 (1), 84-95. Mouginot, J., and Rignot, E. (2015) Ice motion of the Patagonian Icefields of South America: 1984–2014. Geophysical Research Letters , 42 (5), 1441-1449. 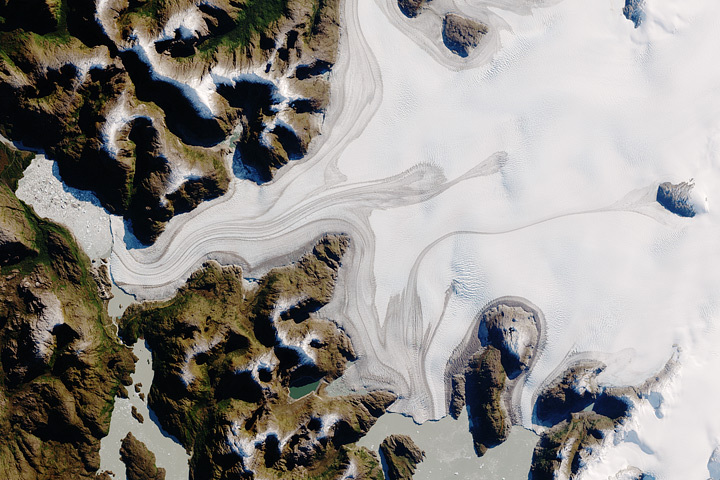 NASA Earth Observatory (2002, February 2) Northern Patagonian Ice Field, Chile. Winchester, V., and Harrison, S. (1996) Recent Oscillations of the San Quintin and San Rafael Glaciers, Patagonian Chile. Geografiska Annaler , 78 (1), 35-49.